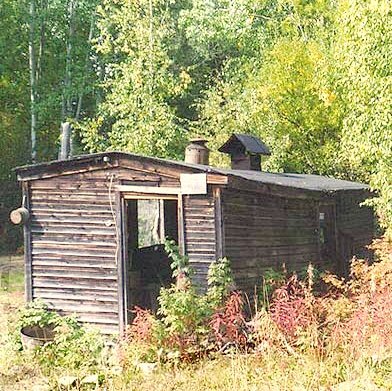 Located 28 miles north of Fairbanks (other side of Cleary Summit), it once was a busy gold mining town and the center of one of the richest placer gold districts in Alaska. The area is also popular with local winter-sports enthusiasts, aurora watchers, and summer hikers. Over 70 million dollars in gold was taken out between 1926 and 1957. Today Chatanika is a "gold camp resort" on the Steese Highway - a lodge with a gold dredge across the way. The gold camp, with a hotel and a restaurant, is the old Fairbanks Exploration Company site. In and around are Alaska memorabilia and mining artifacts. From the lodge comes the traditional "Chatanika Days Outhouse Race". Each March five-person teams race a one-mile course, with four pushing and one riding in the specially built "racing outhouses". The original bunkhouse and dining hall of the Fairbanks Exploration Company are listed on the National Register of Historic Places. The Chatanika Lodge has rooms for rent, a saloon, a package store and family-style dining. Dredge #3, owned by the Chatanika Dredge Company, is a rare and very large piece of antique industrial mechanical mining equipment. Since 1963 it has been in its own frozen pond, not far from the Chatanika Lodge. At one time, is worked the Cleary Creek and Chatanika River. A few hours south of Fairbanks, this is the official end of the Alaska Highway, though Fairbanksans would disagree. 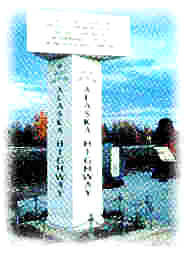 There is an end-of-the-highway monument at the visitors center, near the junction of the Alaska and Richardson highways, and you can buy a certificate verifying that you have reached the end of the Alaska Highway. The Alaska Highway becomes the Richardson Highway, northbound, from Delta Junction, and continues about 100 miles to Fairbanks. There is another very similar monument in Fairbanks at the Visitors' Center, as Fairbanks residents believe you haven't reached the end until you get to Fairbanks. Follow our link for more information on Delta. Note: If you drove up the Alaska Highway, your first good view of the trans-Alaska pipeline northbound will be 9.5 miles north of town on the Richardson Highway, where the pipeline crosses the Tanana River. The first incorporated city in Alaska's interior, located 12 "river miles" from the Canadian border. This Air Force Base is located on the Richardson Highway, about 25 miles south of Fairbanks, and just south of the community of North Pole. Ester: "People's Republic of Ester"
Ester village is a tiny community about 5 miles west of Fairbanks on the Parks Highway. It's boundaries are indeterminate for this former gold mining camp and tourist attraction. The community is an enclave of nonconformists - from university professors to miners to a disproportionate number of artists. They now have their own community market. Located right next door to downtown, this post is actually part of the city of Fairbanks and military residents can vote in all city elections. Christmas town, located 20 miles south of Fairbanks on the Richardson Highway. Tok, Alaska, at the junction of the Alaska Highway and Tok Cutoff (Glenn Highway), is the major overland point of entry into Alaska. For questions regarding this site, or for site updates, please e-mail our webmaster at "thewebmaster" @ "fairbanks-alaska.com" after first removing the spaces and quote marks. See the FAQ for info on advertising on this site. This site of information is provided & Copyright©1998-2015 by Aurora WebMasters, all rights reserved. This page last modified: Saturday, December 20, 2014. Site built and maintained by Aurora Webmasters, member of Certified and experienced in securing high ranking keywords on search engines.